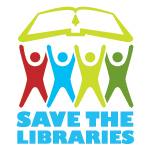 The idea for Save The Libraries came during a meeting of the American Library Association. Karin Slaughter, long a library advocate, spoke to librarians from around the country and realized very quickly that public libraries were in desperate need of help. Karin wrote an op-ed piece which ran in the ran in the Atlanta Journal Constitution on Sept. 10, 2010. The article ran with the headline "Fight for libraries as you do freedom." Read it here, here, or here. In researching this article, she found the statistics startling -- 80% of children in rural areas use their local libraries as their only access to the internet and books. Staff is being laid off. Buildings are being closed. Libraries are built, books are purchased, but there's no funding to open or operate the facilities. To help spread the word about the needs for community support for public libraries, Karin has spearheaded SaveTheLibraries.com, with a pilot event to benefit the DeKalb County (GA) Public Library system. This initial event serves as pilot program during which we are documenting steps of the process in order to make it repeatable at other libraries with minimal amount of staff planning time and administrative investment. We're planning new events in cities near you soon. Please check back. "...the funding of American libraries should be a matter of national security. Keeping libraries open, giving access to all children to all books is vital to our nation’s sovereignty. For nearly 85 percent of kids living in rural areas, the only place where they have access to technology or books outside the schoolroom is in a public library. For many urban kids, the only safe haven they have to study or do homework is the public library."